My next concept comes from Canada with the Calgary Cannons. Bringing the club back from the history books, the team is the top affiliate of the Mariners. 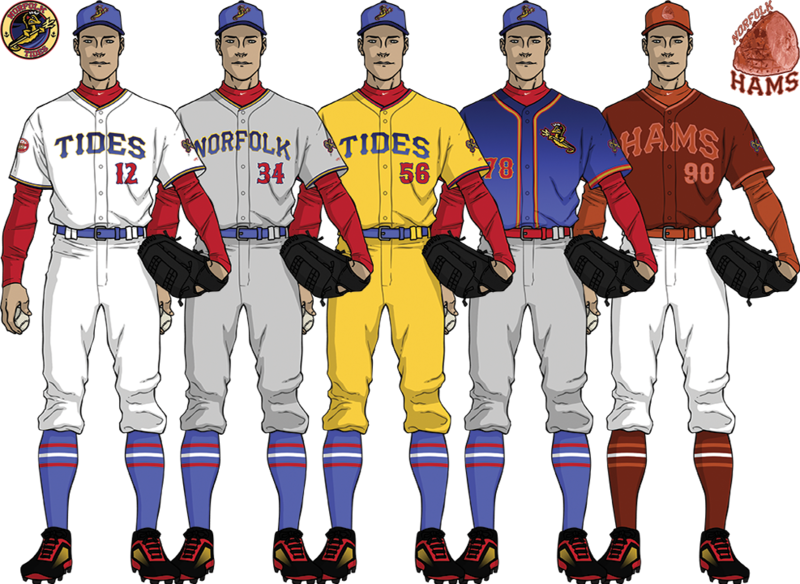 The team's red and brass colors return, but the old blue is replaced with purple to help differentiate them from the Blue Jays, Expos, and Alberta Wild. The cap logo is a maple leaf with a baseball being fired through the middle and is also found on the team's purple uniform. The team receives the occasional identity of the Calgary Poutine to fit every other AAA team. Nice job! Poutine fits perfectly as the food-based identity. I like the new presentation, too. Next up are the Norfolk Tides. Recolored to more closely match their parent club Nationals, the team includes an all-gold alternate at home and a blue gradient road alternate. The team also includes the identity of the Norfolk Hams. What an incredible series! How have I not seen this until just now? (Probably because baseball concepts are usually the least concept-y of all the sports and I am only a casual baseball fan at best). I love the presentation and the explanations for everything you've changed or tweaked. Fun fun fun. More please! I've been following these series for quite a while. I have to say that I really hope this happens when Under Armour takes over MLB. 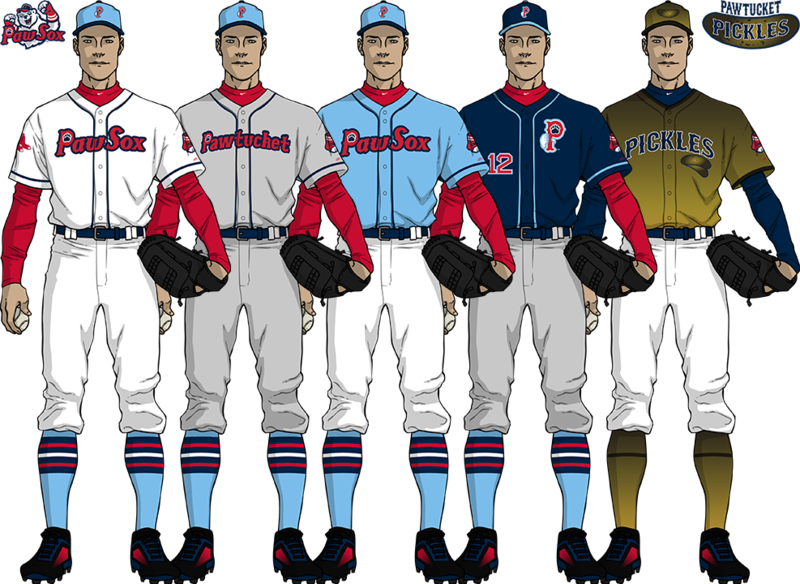 The Pawtucket Red Sox are the next team I've prepared for your viewing pleasure (or displeasure). The uniforms are very similar to the team's current uniforms but with small differences, such as a different logo on the cap. The team also becomes the Pawtucket Pickles, named after the local Fox Point Pickles pickling company. I love the gradient design on the Pickles uniform. Can't wait to see you do my (almost) hometown Charlotte Knights! Nice look for the PawSox. I too like the gradient on the Pickles alternate. Keep up the good work! Next up come the Springfield Cardinals. 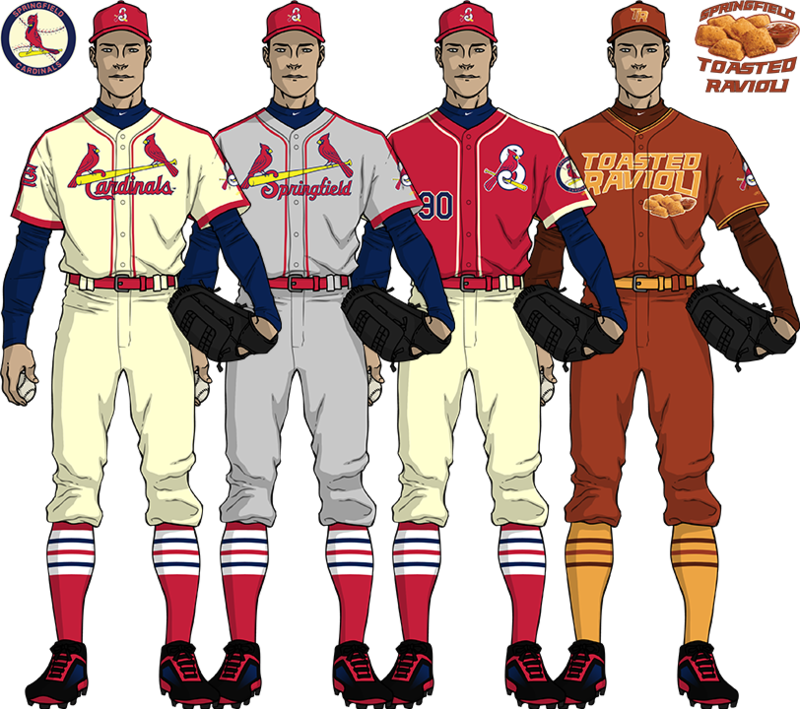 With the team sharing a state and name with their parent club Cardinals, the wordmark on the home uniform is the same, the road uniform's wordmark only changes out the city name, and the colors remain the same. 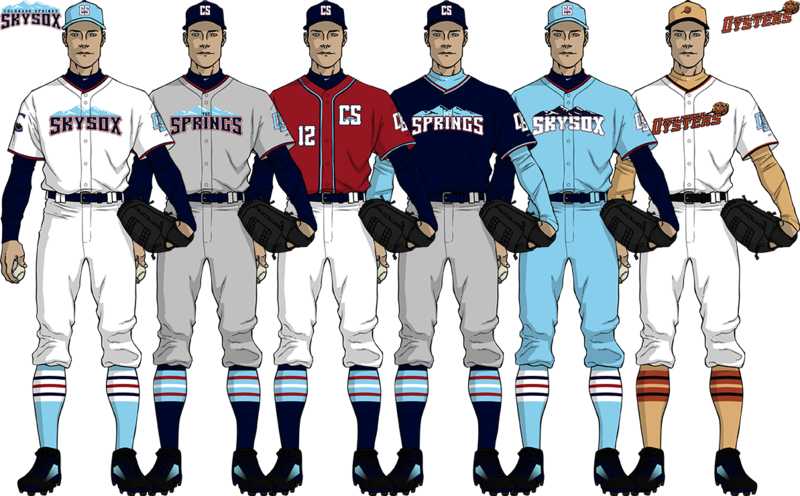 The team also uses the parent club's home uniforms from the days of Stan Musial, which is used as a template for the road uniform as well. The team becomes the Springfield Toasted Ravioli as their food identity. The Las Vegas 51s come next. 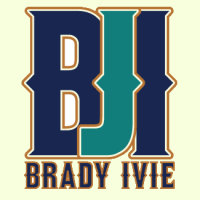 As the new affiliate of the D-Backs, the team gets an unorthodox design. Each uniform has "Las Vegas" on the chest with no white or cream uniforms to wear at home. In fact, the team's primary uniform at home AND on the road is sand-colored. 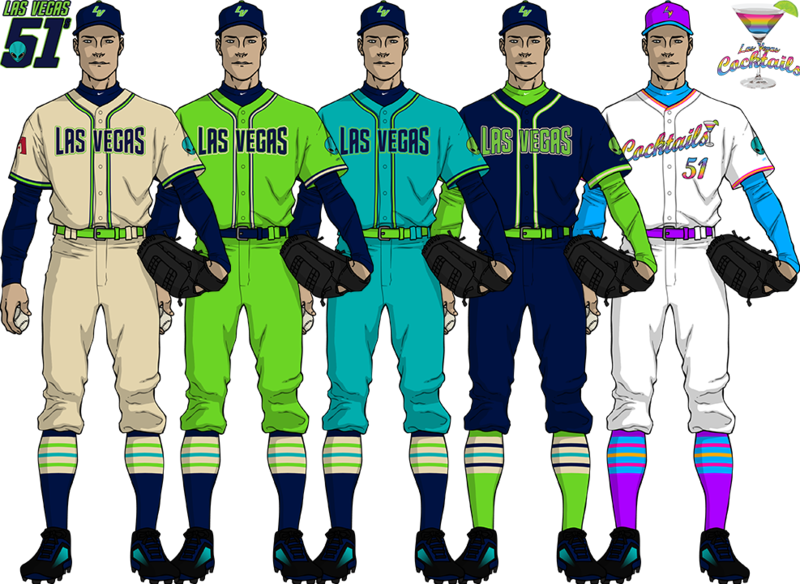 They also have monochrome neon, teal, and navy uniforms to wear anywhere. The team also gets the occasional moniker of Las Vegas Cocktails as their food identity. As the Cocktails, they wear rainbow neon colors. After a much-needed hiatus, I've got the next team ready to go. Please welcome to the stage the Rochester Red Wings. The Red Wings feature four different regular caps, more than any other minor league franchise to this point. The white sleeves on the red uniform are a callback to the uniforms from the '70s. 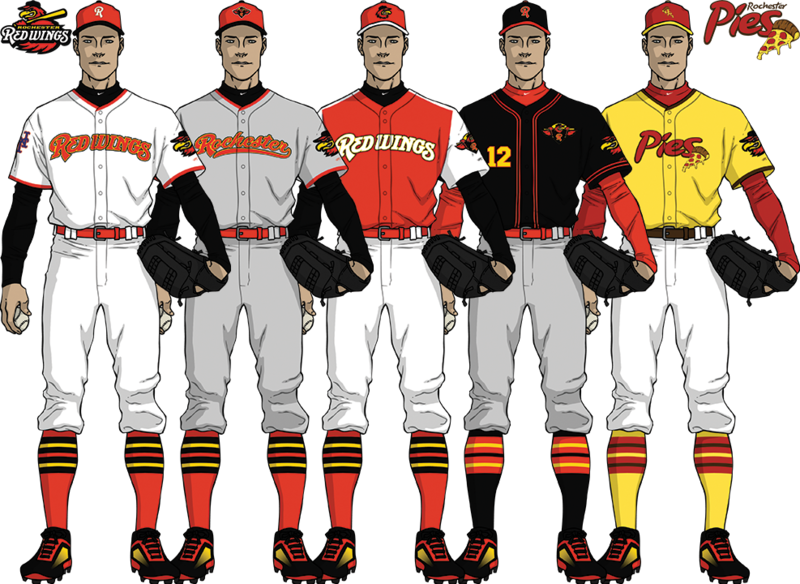 The team's food-based uniforms are under the guise of the Rochester Pies. As some one who has lived in Rochester for several years, I'm disappointed that their food uniforms aren't based on their world-famous garbage plates. The other concepts are fantastic though! Gonna need to take the time to catch up on this thread. I was very tempted to go with Garbage Plates, but there's a distinct problem with that. Garbage Plates are a trademark of Nick Tahou Hots. With the dish being specific to a particular establishment, the team would hamstring themselves into promotional deals to serve the food or even to use the dish as a basis for the uniform. Instead I'm going with generic dishes that any ballpark could serve on their own to maximize the team's profits (these are MiLB teams, after all). And after scouring through your thread, I saw your Iowa Oaks, and while I think it looks fantastic and love the color scheme, I wanted to point out that your "O" is quite similar to my own concept for the Iowa Oaks (since I'm an Iowan myself). I'm not trying to accuse you of stealing my idea or being inspired by my concept if you saw it before or anything like that, but just wanted to point it out. I still think it's a fantastic thread and I will definitely be keeping a close eye on this one! Keep up the good work. I had not seen your concept, it looks amazing! Your wordmarks came out much cleaner than mine did. As for the Plates, that's incredibly ironic, and it looks like they beat me to the punch by about an hour. 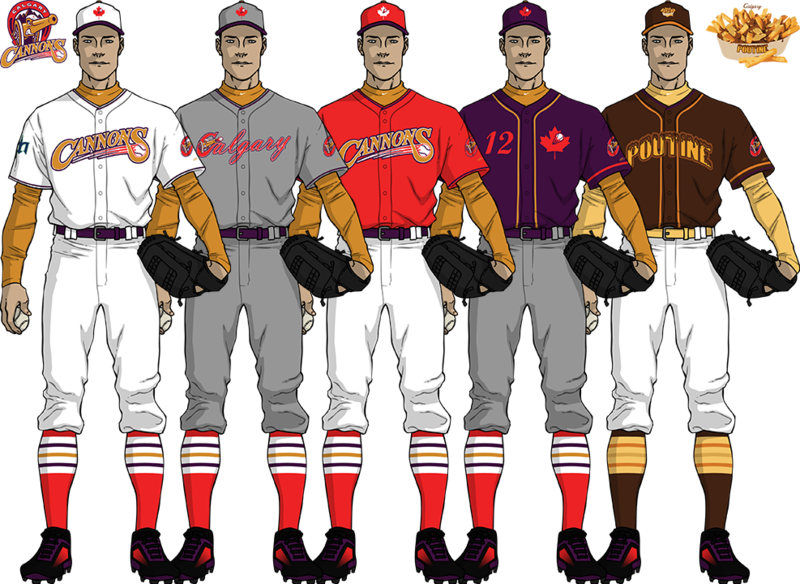 However, I stick by the "Pies", as I don't have another team left in New York to give a pizza theme to in AAA and they're the only league I'm giving food identities to. It looks like I nailed it on the head, as Nick Tahou Hots are clearly involved. And thank you, it's been a LOT of work to try to make each team unique without being garish. 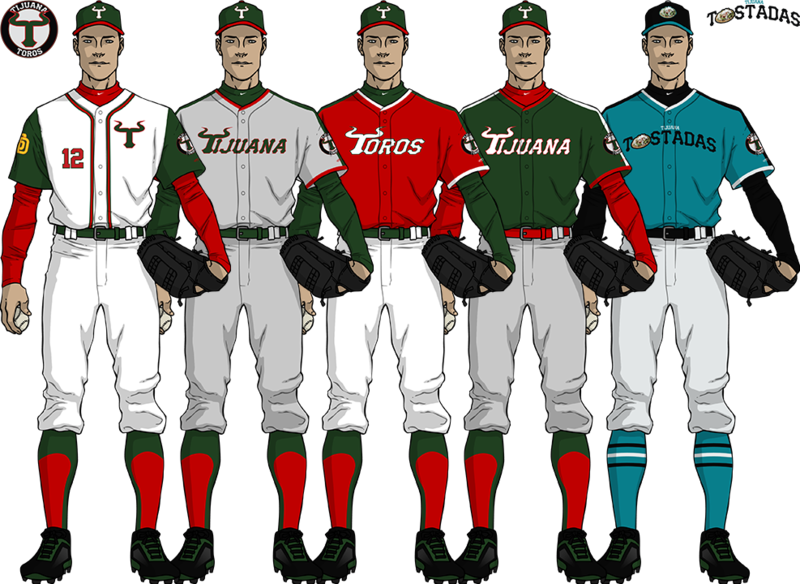 The Tijuana Toros are the AAA-affiliate of the San Diego Padres. Taking their green and red colors from the flag of Mexico, the team takes on the identity of the Tijuana Tostadas as their food identity. Nice job! Great color scheme and wordmarks.